This Mac 'n Cheese fuses elements of Japanese, Mexican and Italian cuisine to give a delicious new twist to the classic comfort dish. Heat butter in a large saucepan over medium heat until melted and foamy. Stir in peppers and garlic and cook for 2 minutes. Whisk in flour and cook for 1-2 more minutes until smooth and golden. Whisk in chicken broth, a half cup at a time, until smooth and bring to a boil. Turn heat down to simmer and cook for 3-4 minutes. Stir in cheese and remove from heat. 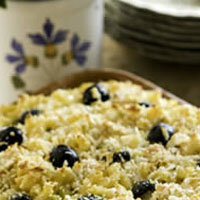 Add pasta, chicken and olives and pour into a lightly greased 9-inch by 13-inch baking dish. Top with breadcrumbs, sprinkle with paprika and bake in a 400°F oven for 15-20 minutes.